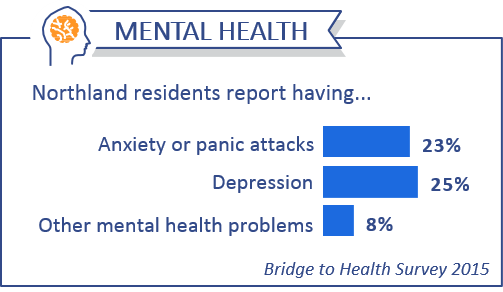 At the 2016 Bridge to Health Conference, participants identified mental health as a major issue of concern in Northland communities. The 2016 Duluth Community Health Needs Assessment also determined that mental health was a top priority for the community to address. Around the same time, local hospitals, community care partners, St. Louis County Human Services, St. Louis County Public Defender, and Corrections met with a goal to coordinate care and collaborate between the criminal justice system and behavioral health systems. It became clear that all were faced with similar issues and frustrations, and the realization of a larger, regional crisis in mental health care. As a result, a regional collaborative, The Clarity Project: A Mental Wellness Initiative, was developed to include representative agencies from across the behavioral health continuum of care. Generations’ contribution to The Clarity Project includes the development, distribution, and analysis of a survey designed to assess the existing adult mental health crisis care resources and gaps in the greater Duluth area. Generations continues to be involved in other initiatives to 1) increase access to mental health services at community sites; and 2) increase awareness of mental health resources.